Asteroids Color Co-Op = Win! During the heyday of the arcade game in the early 1980s, video game companies cranked out clones of popular titles, in the hopes that lightning might strike twice. 1979's Asteroids was a smash hit, one of the greatest video games ever, and thus it spawned all manner of copycats and sequels. Atari released an official sequel in 1980, Asteroids Deluxe. This added a few graphic tweaks but is mainly famous for being incredibly difficult. Asteroids Deluxe didn't sell well, so Atari followed up in 1982 with Space Duel. This game may not be a sequel in name, but improves upon the hallowed Asteroids formula in unique and entertaining ways, enabling it to stand on its own as a Co-Op Classic. If you ever have the opportunity to see a Space Duel in the wild, the first thing you will notice is the art on the cabinet. It is incredible. It may not be as iconic as the foreboding Centipede, or the Cold War inspired Missile Command, but it is still glorious in its own right. 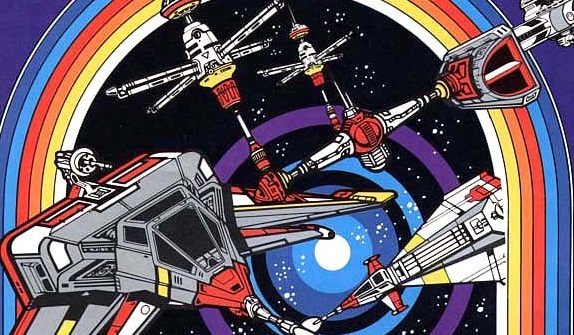 Starships reminiscent of Star Wars' Y-Wings soar in outer space, with a colorful comic book style galaxy pulsing in the distance. The control panel itself wouldn't look out of place in Star Trek, adding to the feel that you are truly piloting a spaceship yourself. Much of the experience in vintage arcade games came from physical elements like these; it just can't be recreated in emulation. Another attribute of Space Duel that is difficult to replicate: color vector graphics. Vector graphics, used most notably in Asteroids and Lunar Lander, have a unique look due to the specialized hardware used for the display. The glowing effect is magnificent, and even more so in color! Space Duel was one of the first color vector games, released right around the same time as Tempest, another timeless classic. The stark contrast between the inky black background and the neon rainbow shine of the graphics truly left an impression on players. Better than the art or the graphics, however, was the addition of co-op. Multiplayer was very scarce in arcades at the time, and even more rare were games with cooperative elements. Space Duel went beyond just adding in co-op, and gave players multiple options that allowed them to tailor their co-op as they saw fit. Upon plunking in a few quarters, the game select screen was displayed, as shown on the next page. Page created in 1.0476 seconds.